The basic plot: Doug's problems are endless. His father is an abusive alcoholic. His brother Chris steals his things and constantly picks on him. His other brother Lucas is away in the Vietnam War. He has just moved to a new town so he has no friends. He is about to start eighth grade and struggles with reading. Before school starts, Doug manages to make friends with Lillian (Lil') who gets him a job making deliveries for her father's deli. 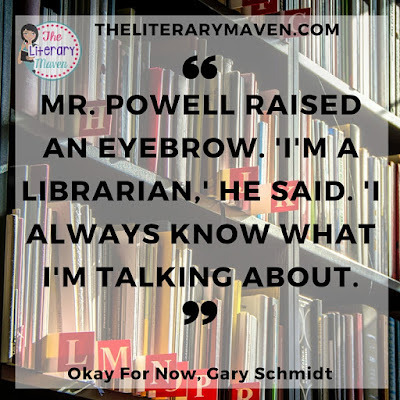 He also befriends Mr. Powell, a librarian, who helps him discover his talent for drawing. But as Doug reminds us throughout the book, just when things are going good, they take a turn for the bad. Doug is struggling in school. He mouths off to his PE teacher, the principal is out to get him, and his math teacher won't call on him no matter how many times he raises his hand. His brother Chris is suspected of robbing some local businesses and his brother Lucas is coming home from the war with unknown injuries. His dad is still an abusive alcoholic. By the end, Doug has grown and changed for the better, as have many of the other characters, and many of the issues he hasn't been able to resolve himself, are resolved on there own. There's no happily ever after perfect ending (because that would be unrealistic! ), but happily enough to be a feel good book. Why I liked it: In Okay for Now, Doug is a very realistic character. He has down periods but always manages to pick himself up. He struggles with whether he wants to be like his brothers or be himself. Doug also makes meaningful relationships with other characters in the book, impacting their lives in positive ways despite their (on and off) stereotypes of him. The customers on his delivery route come to care for him and Doug helps them with aspects of their daily lives: replacing light bulbs, putting away groceries, and even babysitting. 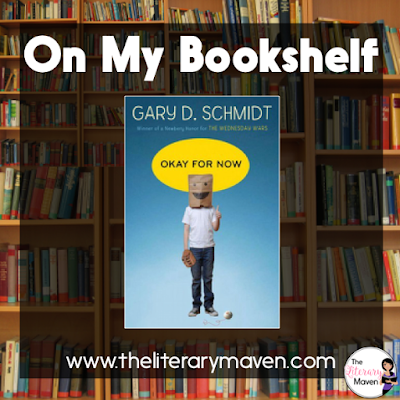 Classroom application: Novels with strong male protagonists are hard to come by, but Okay for Now would be a sure winner for middle school boys (maybe 5th - 9th grades) and relatable for girls as well. Doug is just the right mix of smart aleck and underdog. As a high interest text, this would be perfect for independent reading (students would want to read it on their own time) and/or literature circles. Students would have great discussions about being judged as the younger sibling, dealing with troublesome brothers or sisters, adults treating teens unfairly, etc. This book also has art, science, and history connections. Doug receives drawing instruction from Mr. Powell, the librarian because he is so inspired by the collection of Audubon's printing plates displayed in the library. They discuss composition, horizon lines, shading etc. An ELA teacher could partner with an art teacher to teach the lessons outlined in the book with the plates of the birds with which Doug is so fascinated. John James Audubon was a famous ornithologist (studier of birds), so this fictional text could be paired with nonfiction texts about birds and birdwatching. Students could try to photograph and identify birds in their own neighborhood and parks. You could take a field trip to a local birdwatching hotspot or have members of a local Audubon Society come an speak to your class. Audubon (April 26, 1785 – January 27, 1851) could also be studied as a historical figure. He led a fascinating life. Or focus on the philosophy of naturalism: when were those ideas most popular? What other famous figures shared these beliefs? Are they still practiced today? 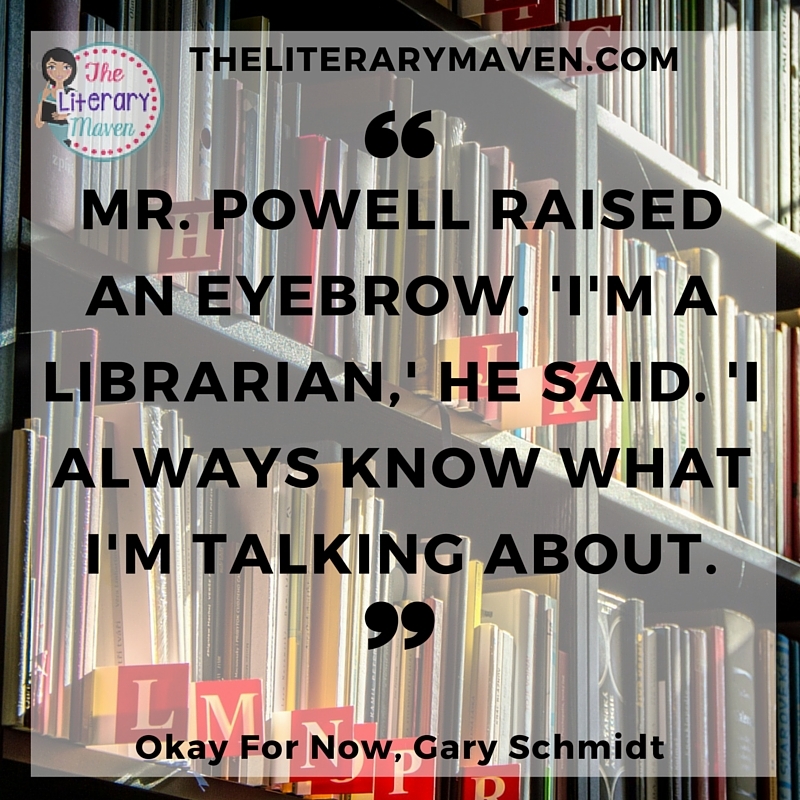 Okay for Now is a companion book to The Wednesday Wars, which takes place first and in which Doug is a minor character. I look forward to reading that as well. 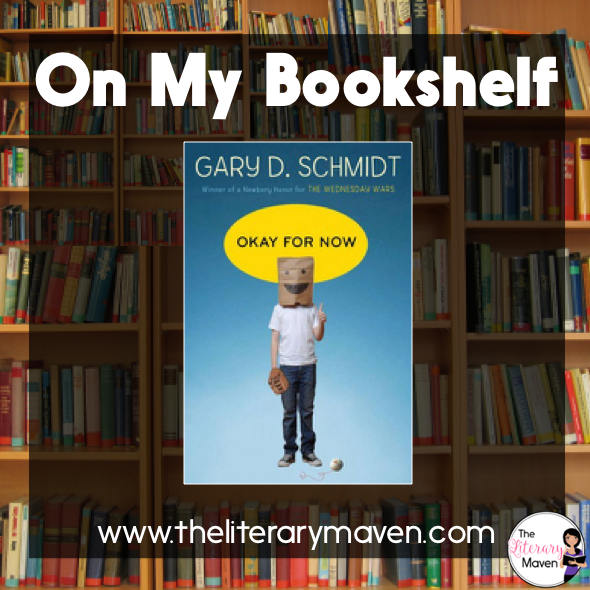 If you are interested in purchasing a copy of Okay For Now for yourself, you can find it on Amazon here. Thanks for the review, Brynn! I've read Wednesday Wars, and seen this one around, but it didn't make it to the list of books I wanted to read this summer. I'll have to take a closer look - I'm always looking for good realistic fiction books for boys.